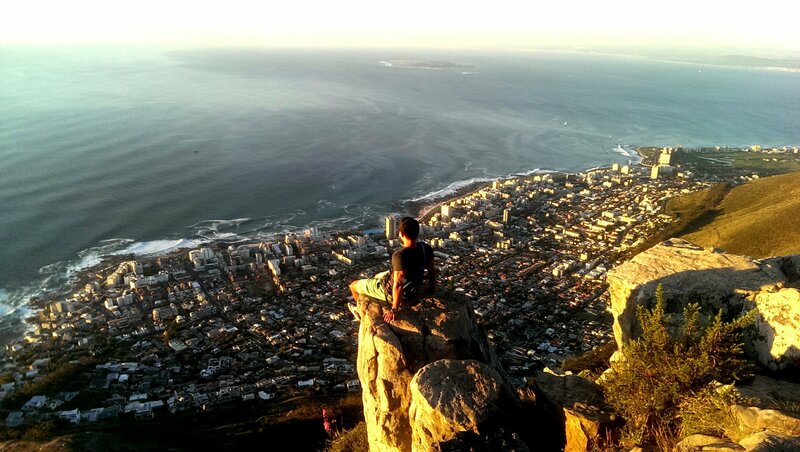 Table Mountain and Lions Head are Cape Town’s two most iconic mountains and most iconic hiking trails. They both allow for a physically stimulating hike, and both afford some of the most breathtaking views in the world. Having lived in South Africa for so long, I’ve been lucky enough to hike both (multiple times). If you’re visiting, you might have the unlucky choice of deciding which mountain to hike if you’re short on time. 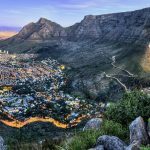 This post along with my ultimate guide to cape town will solve all those questions in your decision process! 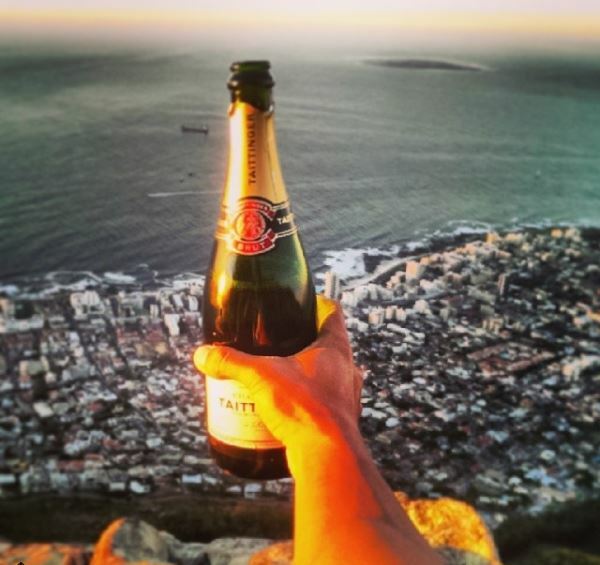 Lion’s Head vs Table Mountain, which is better? 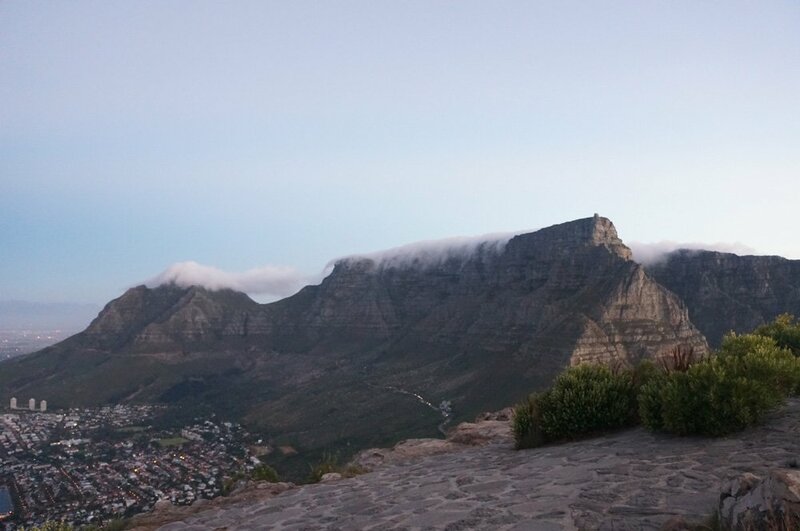 One of Cape Town’s top attractions, Table Mountain was recently voted as one of the new wonders of the world. It’s not hard to see why. Its impossibly flat peak is visible from all of the surrounding area and is perhaps the most iconic landmark in Cape Town. 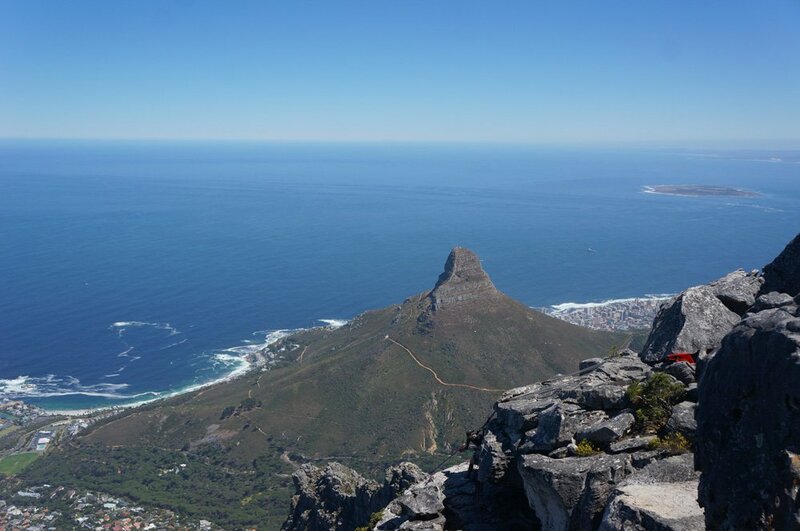 Sandwiched between Devils Peak and Lions Head, Table Mountain stands 1km above sea level. 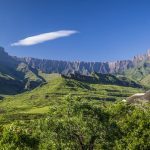 It is also one ofone of the oldest mountains in the world being hundreds of millions of years older than even the Himalayas. Then there are the views. Panoramic views of Cape Town, all the way down to Cape Point can be seen from its peak allowing for breathtaking photos. Table Mountain seen from Lion’s Head. 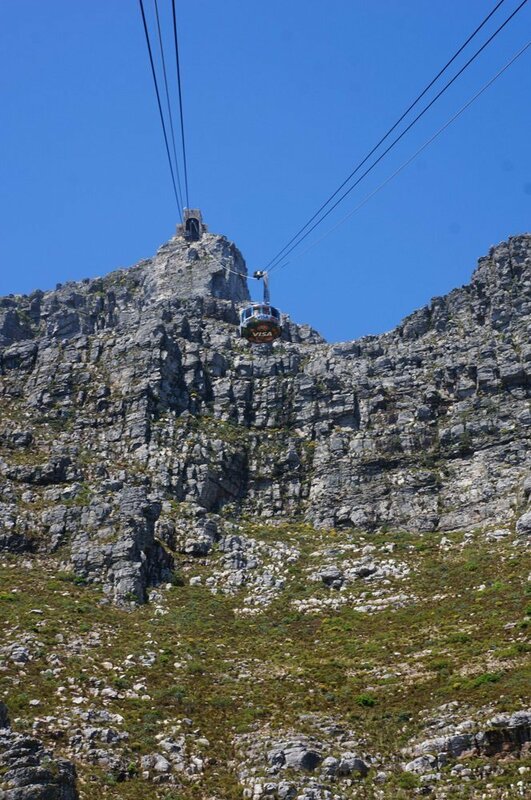 Unlike Lion’s Head, which can only be hiked, there is the incredibly popular table mountain cable cars that will take people straight to the top. Two cars, holding 60 people a piece go up and down this thing and it’s only a short 7 minute ride. However, during high season on ANY nice day, the line for this place is ridiculous. I came once before, with the intention of using the cable car but the line was 3 hours so we gave up and went to Lion’s Head instead. The line to get on the cable car. Left and ride sides are both lines! The second time, I was determined to use this damn thing to get to the top. We came here at 8am, thinking we’d be early enough to avoid the lines but not a chance. Even at 8am, the line was 2 hours. We had some friends wanting to hike up the mountain which I wasn’t against, and after discovering the long line, I was all for hiking. Also, the hike takes the same amount of time so screw it, hiking up we go. The cost for the cable car if you’re willing to wait is 210R round trip. Tickets can also be purchased ahead of time online, but you still need to wait in line. Table Mountain Cable Car in action! Note that the second time I visited was during New Years so naturally you’ll see a spike in tourism. It’s not always so packed, but you should always plan for a crowd in the summer months. The hike up Table Mountain is no joke. 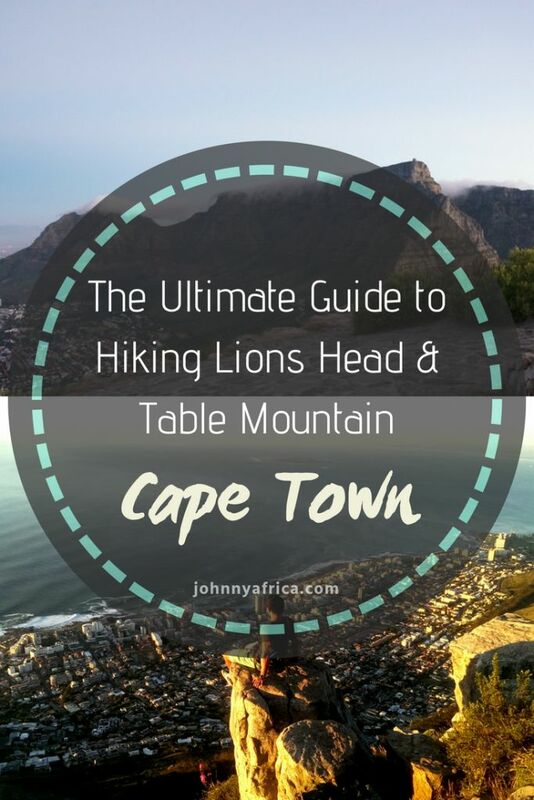 It’s physically more demanding than the Lion’s Head hike and far less fun. It is, to sum it up, just non-stop stair-master. The hiking trail is very structured, and consists of thousands of rocky steps. The hike starts from the Plattekip entrance, about 1km down from the cable car. The signs here say it’ll take 2.5 hours to hike to the top, but if you’re in decent shape, which I’d consider myself to be in, it should take no more than 2 hours. Making our way to the top! With a few breaks in between, we completed the hike in 1.5 hours. They also recommend 2 liters of water for the hike, I think that’s a little ridiculous. 0.5-1 liter should be plenty because you don’t want to weigh yourself down. The hike was taxing, but we took about 5 short breaks (1-2 min), and we were up before we knew it. There were some crazy people that more or less ran up the mountain and did it in an hour. I’d also recommend doing this hike in the morning or before sunset so to avoid the heat. After 1.5 hours, we’re finally at the top, and what a gratifying feeling it is. The top of the mountain is huge and you have to walk to the edges in order to have a view. There are many viewing points and I’ve yet to find the ultimate picture spot but I’m sure I will be back. There is a restaurant/cafe up here that serves food, and beverages, including alcoholic ones to celebrate the climb! We stayed up here for about 1 hour to have some drinks and take our pictures. We took the cable car down as we had enough to hike for the day. The line was much shorter to get down. Views from the top of Table Mountain! 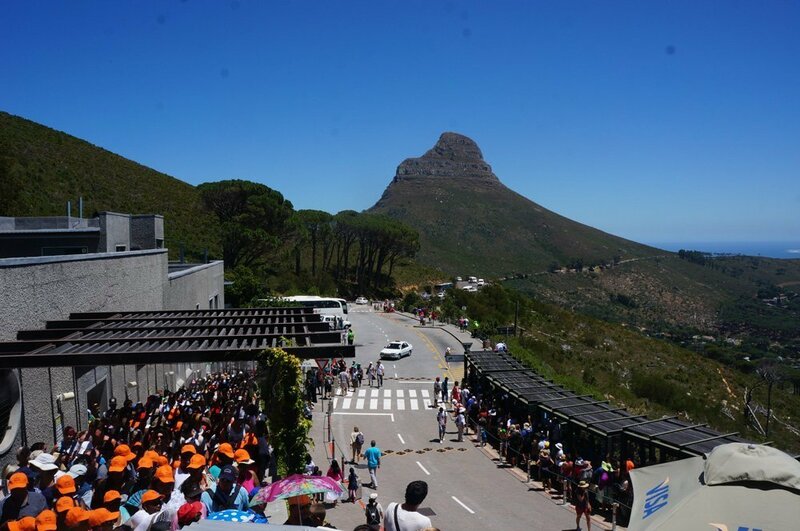 Shortly after hiking Table Mountain, we were aiming to go to Cape Point midday but the traffic was so horrible that we turned around and went back to our hotel in Camps Bay. A short nap later, I decided we needed to climb Lion’s Head as well so to get both mountains in. 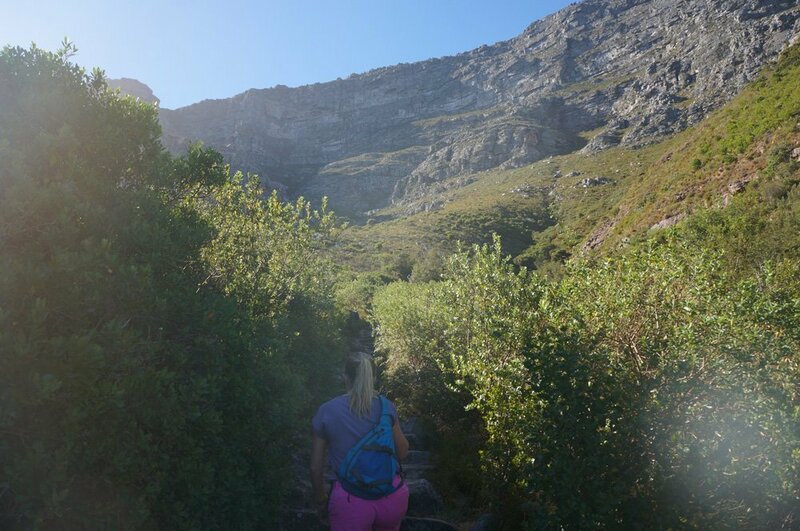 Climbing both Table Mountain and Lion’s Head in the same day is not for the feint of heart and most people thought we were crazy to do it. But we did it anyway! Compared to the first time I climbed this, I was not hungover, and I wore proper shoes which made it much easier to climb. I wasn’t winded at any point and I think this is one of the best hikes I’ve ever done. To get to Lion’s Head, simply drive on the road towards Signal Hill and the base of Lion’s Head will be located before you reach it. There is parking all on the side of the road and you’ll know where the entrance is just by the row of cars parked. The hike up Lion’s Head is much easier physically than Table Mountain. Not only is it a shorter hike but it zig zag’s around the mountain whereas Table Mountain is a straight shot up. Lion’s Head is also a more fun hike in my opinion as there are some very minor rock climbing (chains and ladders) aspect to it! People in front hiking up Lion’s Head. All in all, the hike will take about 45 minutes to 1 hour. When you’re at the top, you’ll see many other hikers soaking up the views. There are no bars and no restaurants here, it’s completely untamed which I absolutely loved. During the summer months, the top can be quite packed but can you blame people for appreciating such stunning views? To make it even more enjoyable, make sure to take some beers, or a bottle of wine from perhaps a previous day of wine tasting in Stellenbosch with you to enjoy at the top :). I didn’t do this the first time and got serious FOMO by seeing all my fellow hikers cracking open beers and wine bottles. 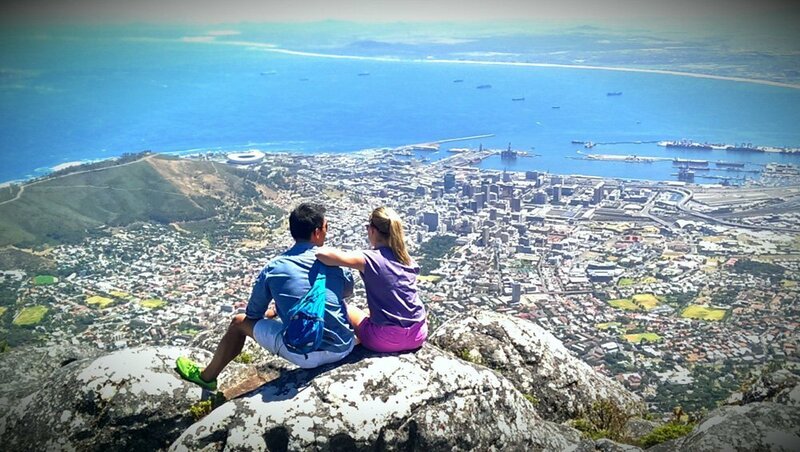 Fewer places in the world offer nicer views than Lion’s Head! It’s easy to find your spot at the peak of Lion’s Head. I found this little ledge to enjoy some sundowners! 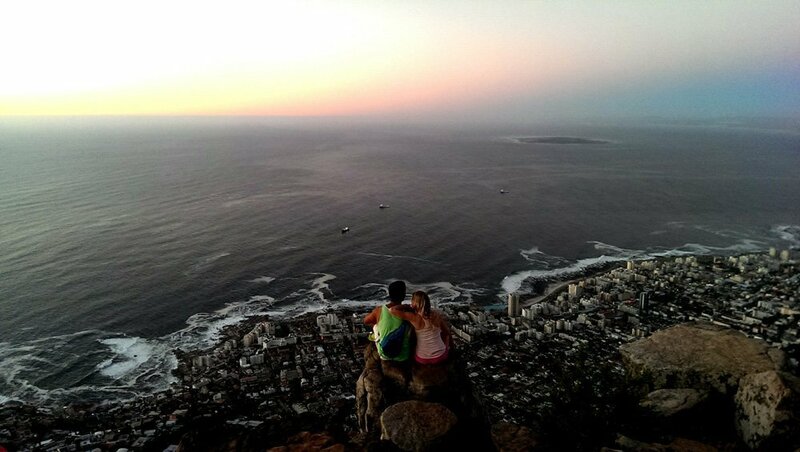 I’d highly recommend this to anyone that wants to do something active in Cape Town, likes amazing views, or want to get actively romantic with their significant others like my friends did on their honeymoon! Type of hike Stair-master Obstacles, Rock Climbing, etc. In my humble opinion, Lion’s Head is the better choice. Table Mountain is beautiful no question, but if I had to only go up one, it would hands down be Lion’s Head. 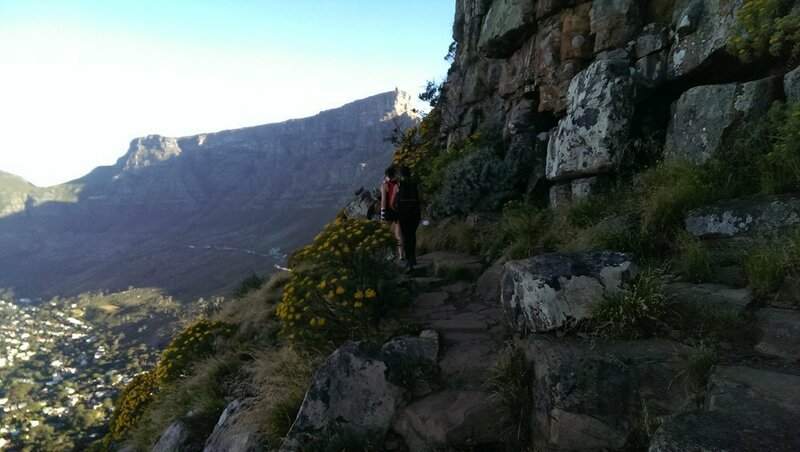 The hike is shorter but it is more fun, unlike the endurance based stair-master hike of Table Mountain. 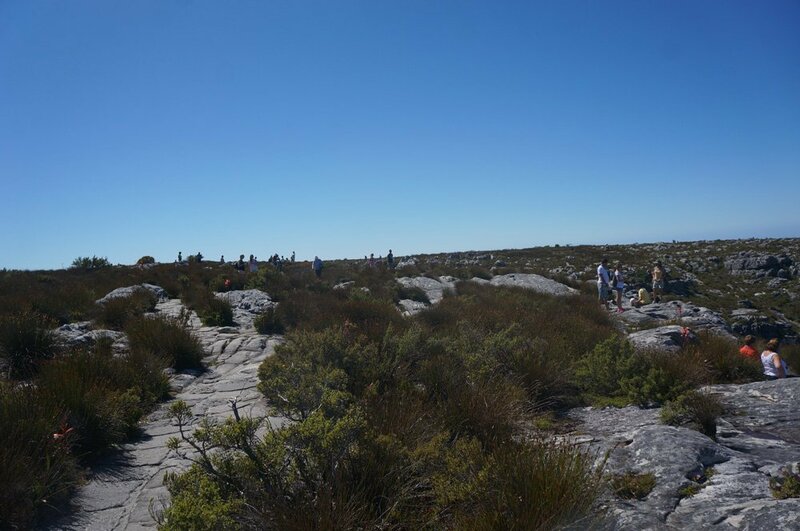 When you ascend to the peak, there are far less people on Lion’s Head and it feels more isolated and special whereas there are SO many people at all times on Table Mountain. From Lion’s head, you are closer to the city and ocean which affords it better views in my opinion. Also, Lion’s Head is one of the only places where you can actually see Table Mountain, which is stunning to look at from any angle! Lion’s head is the best place in the city to get a picture of yourself. No questions asked, just find the rock from the picture above and you’ll see what I mean. In the end, both of these mountains will afford you some of the best and most memorable views of Cape Town. -and- Have you seen any on these trails? Ethan recently posted…How to be an Effective Airsoft Sniper? Great place and also some great photos and video. You made an informative article that will be helpful. I will pin this article for the future of mine. Thanks for sharing your article. We booked a tour with viator to go up table mountain but we bought our own cableway tickets. On the day of tour, cableway was closed due to strong winds beyond 25 knots. The cableway tickets are valid for 7 days so do leave yourselves alternative dates to utilise it. We were fortunate upon our return from Hermanus to Capetown, we were able to ascend the mountain on our last day in South Africa. 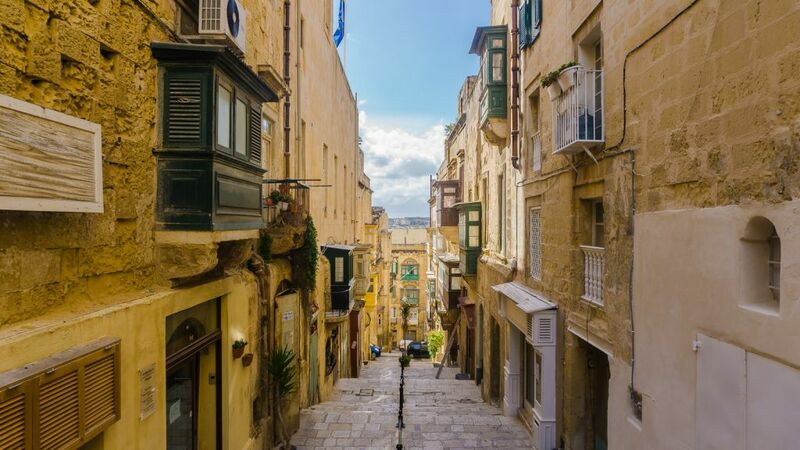 Give yourselves at least 2 hrs to walk around the plateau and enjoy the various viewpoints. On 20 Aug, It was freezing so winter jacket, cap and gloves were necessary. At times the clouds may block visibility so give yourselves sufficient time for the fog to lift. Dassies were everywhere on the rocks sunbathing. Glad to be of help :). 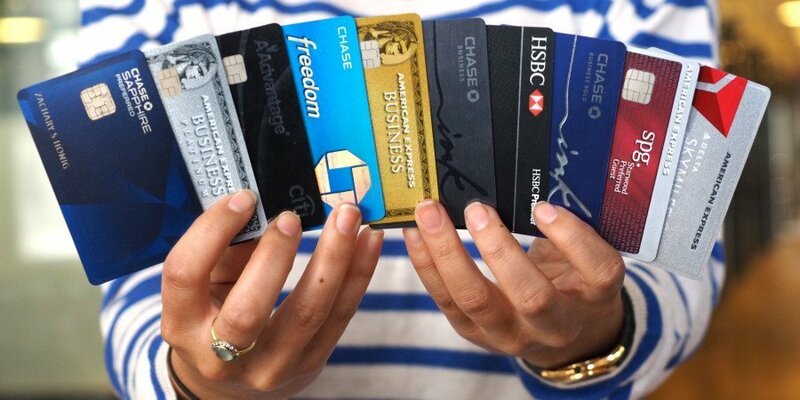 Which one are you going on?? Enjoy the hikes!